Pan-Fried Chickpeas and Onions are simple, yet full of flavor, seasoned with fresh garlic, smoked paprika, and cayenne pepper. Oh, delicious little chickpeas...where have you been my whole life? I'm not sure why I was so put off by chickpeas for the better part of my days, but it's a darn shame that I was because they are gooooood. I've discovered that chickpeas, also known as garbanzo beans, are incredibly versatile little things. They can be roasted until nice and crispy and seasoned with either sweet or savory spices for a healthy snack that rivals the mighty potato chip. Don't believe me about that? 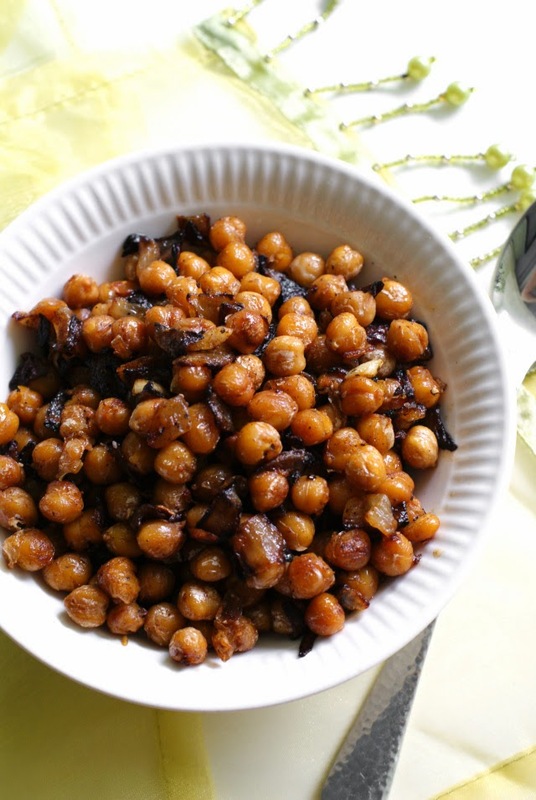 Try my Buffalo Roasted Chickpeas or Sesame Garlic Chickpeas. Both are very snack-worthy. Trust me on this one. Chickpeas can also be blended up into creamy dreamy hummus. Hummus can go so many ways as far as flavoring, like my Sun-Dried Tomato Hummus, Roasted Jalapeno Hummus, Classic Hummus. Perfect for dipping veggies or crackers. Love, love, love it. I've also been told that you can make desserts with chickpeas. I've yet to try it, but I am for sure intrigued. Because chickpeas are amazing. This time around I pan-fried my chickpeas with onions and garlic, then I seasoned them up so they were a little smoky and a little spicy. Yum and yum. I ate them on their own as a simple vegetarian lunch (actually they weren't 100% vegetarian -- See Notes), but prepared this way, they could also be served as a side dish or on top of a salad. They were perfectly delicious and I can't wait to make them again! Heat the oil in a skillet over medium-high heat. Add the onions and chickpeas to the hot oil and cook for 10 minutes, or until golden, stirring occasionally. Add the garlic, smoked paprika, salt, pepper and cayenne to the pan and cook for 2 more minutes, stirring often. My onions are a little dark and crispy in this pic, but that's how I like them! I'm sure my Mom will say they look burnt, but don't let the pic deceive you. They were cooked just right for me and didn't taste burnt at all. I have a secret. Instead of 2 tablespoons of oil, I used 1 tablespoon of oil and one tablespoon of bacon grease. Yes, I have a jar of bacon grease in my fridge. Doesn't everyone? All oil is totes okay, but oh, that bacon grease adds a little something special that you just can get from oil.